The Grammy Award-winning singer will also release an album that month with Wal-Mart Stores. More personally, she's working on losing more weight from her frame, which is noticeably slimmer since her December surgery. "I want to not only maintain the weight I am at now, but better it, by one dress size," the Queen of Soul said. Aretha, 68, underwent surgery for an undisclosed ailment in December. She calls it "more than minor surgery". At the time, word spread that her situation was dire, and she received a multitude of prayers and well wishes from fans. She dismissed reports that had her on her death bed: "You can't stop people from saying whatever it is they're going to say - you have no control over that." 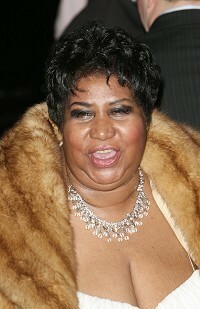 Since her surgery, Aretha has been working out and walking on a track three times a week for at least a mile. But she said her biggest health change has been in her diet: She's given up her beloved chitterlings, pigs' feet and ham hocks in favour of a whole foods-type diet, and she hopes to get down to a size 16. Aretha, who cancelled several performances last year because of illness, has set her first concert since surgery for May 28 at the Seneca Niagara Casino in Buffalo, and is set to release her long-awaited album, Aretha: A Woman Falling Out of Love, the first week of May. R Kelly is one of the album's songwriters.